Last week we visited three local restaurants that were new to us and I thought I would blog about them! The first we visited late on Wednesday night.. 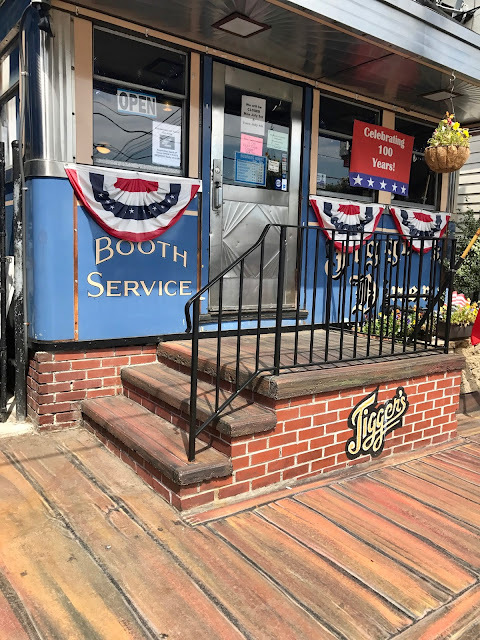 The Trap is located near Goddard Park in East Greenwich and is always packed whenever we drive by so we have been dying to try it (Tim especially). So on Wednesday night when Tim suggested we go I was game to give it a try. The atmosphere was great and it was pretty crowded but we were able to be seated right away. We sat outside on the patio where they had a musician singing and playing guitar. The music was great, the food was awesome and the weather was perfect for outdoor dining. I wish I had taken additional pictures because the outdoor fireplaces were gorgeous. I forgot to take pictures of the food as well but I ate a french dip sandwich which was great and Tim had the Trap Burger and he enjoyed his as well. On Thursday night we went to Feast Sandwich Co. which is located right on Main Street in East Greenwich. Feast is a tiny little sandwich shop and when we went inside we were the only ones there. It's very eclectic inside and the menu was different then what I was expecting. We ordered after a few minutes and got some popcorn to snack on which was a nice surprise! I ordered the Mexicana which is a hot dog with cheddar cheese, fresh pico de gallo, crumbled tortilla chips, jalapeño peppers and soft cotija cheese. I ordered it without the pico de gallo because I'm not a huge fan of it but the hot dog was amazing! The curly fries were great too! Look how delicious it is! Tim ordered the Labriola and he said it was good but he wished he had ordered one of the burgers. It was a delicious meal and I think we will definitely be back for more meals there! 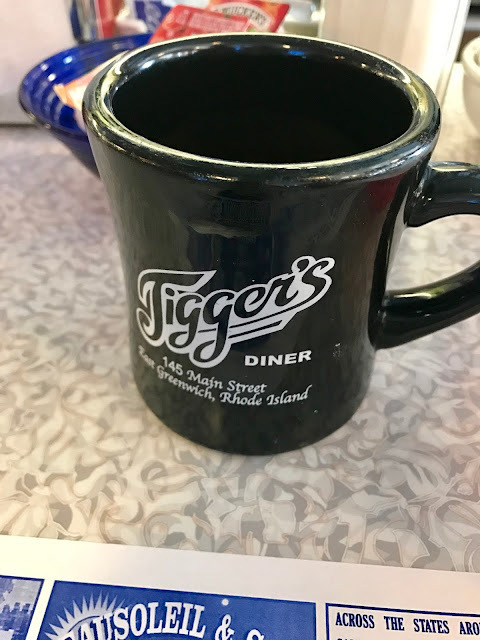 Yesterday we decided to eat breakfast out at a local diner. Jiggers is located right on Main Street in East Greenwich. Tim suggested we try it and while the food was delicious it was not my favorite breakfast spot. It may have been totally different if we waited for a booth but instead we took stools at the counter and man they were super uncomfortable. I couldn't get comfortable the entire meal and couldn't wait to be done! They serve flavored coffee and this particular morning happened to be Snickerdoodle which was very tasty. 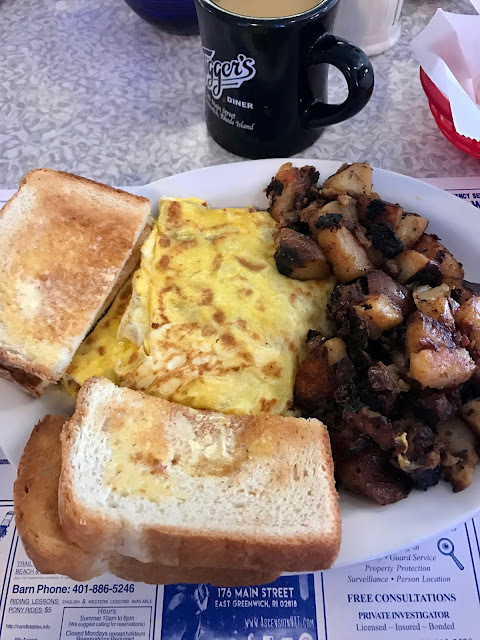 I ordered a cheddar cheese and bacon omelet along with homefries and white toast. All of my food was delicious. 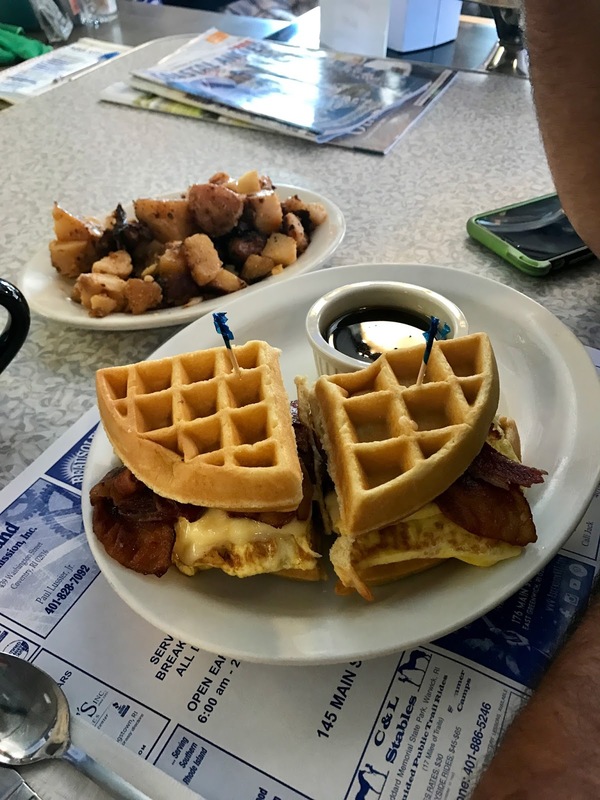 Tim had the Bacon Cheddar Waffle-wich and home fries and thought his food was delicious as well. If we go back I will definitely insist on getting a booth so I am more comfortable! Where have you eaten lately? Any amazing local restaurant?